An RFP is due for developers this Friday, April 21, to transform the city of Southfield. Southfield is seeking to transform an 8.15-acre parcel into a pedestrian-friendly, traditional downtown, something the city has never seen. Planned in the middle of the 20th century, Southfield embodies a suburban era of design where cities were built for the automobile and not people. Terry Croad is Director of Planing for the City of Southfield. Since joining the city in 2010, he’s made it his mission to help transform the city center into a more urban, walkable destination. He started with a series of small steps; things like filling in gaps in the sidewalk around the municipal center, making Evergreen Road more pedestrian friendly, and installing bike racks and improved bus stops. The increased pedestrian activity from those efforts has helped convince city leaders that a change was possible and vital for Southfield. 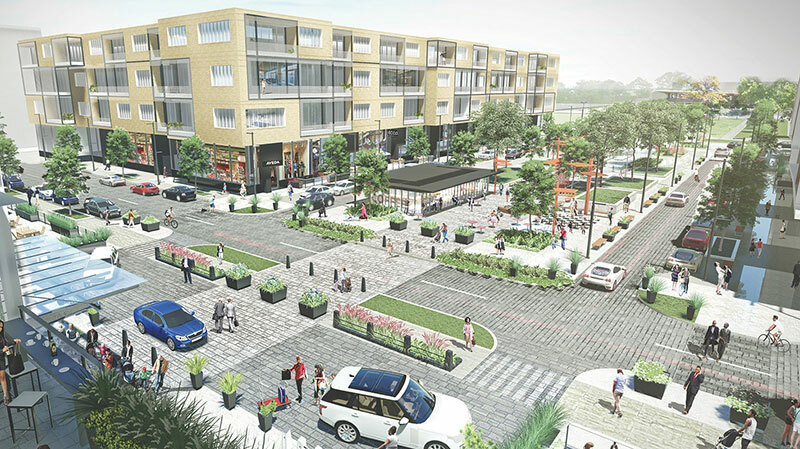 The RFP put out calls for the construction of EverCentre, a high-density, mixed-use district that incorporates a pedestrian-friendly Complete Streets infrastructure at the corner of Evergreen Road and Civic Center Drive. Plans call for multiple-story buildings of mixed residential and office use with retail on the ground floor, creating a more traditional downtown setting complete with a streetwall built right up to a sidewalk filled with outdoor seating. There’s also plans for a new park with entertainment programming among its features. That’s not all Croad and his team are working on. Southfield is launching a bike share program by mid-to-late June, with 22 bikes spread out over five to seven locations, including the municipal center and Lawrence Tech campuses. A bike and greenway trail is also being built, with landscaping to be installed this spring. The trail will run along Northwestern Highway. Croad likens it to the High Line Park in New York City.